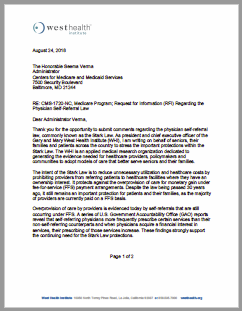 Thank you for the opportunity to submit comments regarding the physician self-referral law, commonly known as the Stark Law. As president and chief executive officer of the Gary and Mary West Health Institute (WHI), I am writing on behalf of seniors, their families and patients across the country to stress the important protections within the Stark Law. The WHI is an applied medical research organization dedicated to generating the evidence needed for healthcare providers, policymakers and communities to adopt models of care that better serve seniors and their families. The intent of the Stark Law is to reduce unnecessary utilization and healthcare costs by prohibiting providers from referring patients to healthcare facilities where they have an ownership interest. It protects against the overprovision of care for monetary gain under fee-for-service (FFS) payment arrangements. Despite the law being passed 30 years ago, it still remains an important protection for patients and their families, as the majority of providers are currently paid on a FFS basis. Overprovision of care by providers is evidenced today by self-referrals that are still occurring under FFS. A series of U.S. Government Accountability Office (GAO) reports reveal that self-referring physicians more frequently prescribe certain services than their non-self-referring counterparts and when physicians acquire a financial interest in services, their prescribing of those services increase. These findings strongly support the continuing need for the Stark Law protections. At WHI, we understand the importance of moving away from FFS to alternative payment models (APMs). However, the majority of providers and patients are not yet involved in APMs. In 2016, only 10 percent of the U.S. population was covered by an accountable care contract.1 In 2017, 29 percent of U.S. healthcare payments were tied to APMs.2 As a result, WHI has made public awareness of these efforts one of our highest policy priorities as we fully support initiatives to reduce healthcare costs, while promoting access to higher quality, value-based care. CMS and CMMI should also use their existing authority to thoroughly learn what potential changes in the Stark Law might be warranted to facilitate coordination among providers to enable more efficient and effective care in the future. However, it is also critical the movement away from FFS to APMs needs to be much more widespread before any revisions to the Stark Law are enacted. As long as APMs are not universal, Stark Law protections need to remain in place for patients who are still being served under FFS arrangements. We sincerely appreciate the opportunity to provide feedback as part of the Physician Self-Referral Law Request for Information. If you have any questions, please contact me at 858-412-8677 or slyford@westhealth.org.